After a wonderful episode today, this week's episode ends with kourin having to fight daigo. When i first saw this i was like ok this is going to be good as it will give us a sneak peek of the upcoming cards in Daigo Special Set set to be released on 1 June 2013. One of the cards that has been leaked is Sanctuary Guard Dragon. 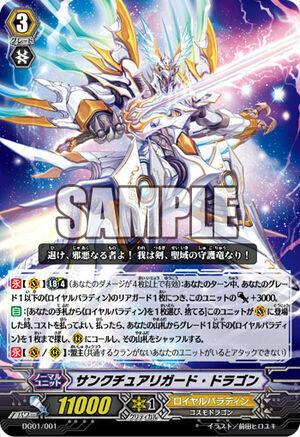 This unit is supposedly a Fang of Light, Garmore remake with a base of 11000 attack power, Sanctuary Guard Dragon (SGD lol singapore dollar but hey thats the initials what to do) easily triumphs over garmore in the sense that SGD get +3000 for every grade one or lesser rear guard (doesnt specify a particular name) while Fang of light Garmore only get +1000 for each SNOGAL OR BRUGAL on your rear guard. 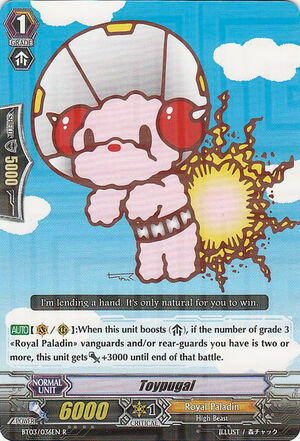 Although both have the same effect of dropping a Royal Paladin card from your hand in order to superior call a grade 1 or less rear guard, SGD is definitely a better card because you can call ANYTHING while garmore can only call snogal or brugal. Strategy wise, SGD is terrifying with the current break ride, set him up with a Swordsman of Explosive Flames, Palomedes and Toypugal combo and your opponent will have a hard time to guard if they do not have a perfect guard in their hands. I am interested to see what cards are supposedly going to be released in order to make SGD even more terrifying. Stay tuned for more Cardfight Vanguard news.